Through the building of the Maximilianstraße with its green areas designed by Carl von Effner, the bridge and the Maximilianeum, a dominant bridgehead was created on the banks of the Isar, which was intended to promote further municipal development. The eastern plateau was now connected with the city. In the year 1857, Carl von Effner was commissioned by the king to construct a footpath and green area on the right-hand bank of the Isar between Haidhausen and Bogenhausen. 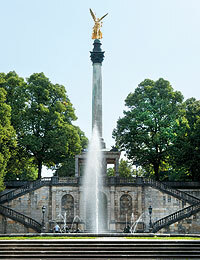 The result was the 30-hectare Maximilian Park, laid out between 1861 and 1897. The steep bank of the Isar had been used for grazing sheep and was badly eroded. Effner modelled the terrain, transforming it into an attractive park with paths following the high bank and crossing the slope and groups of trees and shrubs framing many attractive views of the city skyline. The bottom of the valley was still prone to flooding and could not therefore be included in the park. Between 1861 and 1866 Carl von Effner applied similar design principles to the Gasteig Park south of the Maximilianeum, which is today part of the Maximilian Park. With the high part now used as a municipal sports field, this section of the park has not retained its original form. In 1890, Prince Regent Luitpold commissioned a bridge at the end of the Prinzregentenstrasse and a continuation of the road straight across the park in an easterly direction. 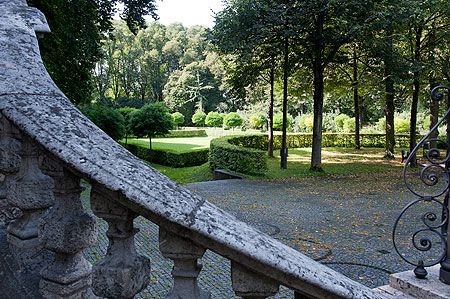 Carl von Effner's successor, Jakob Möhl, and his colleague Wilhelm Zimmermann created the terraces with steps and formal gardens and built a road divided into two symmetrical u-shaped ramps, completing the work in 1893. The connection between the terraces and the park and the extension of the park in the former flood area at the bottom of the slope was begun in 1894 from plans by Wilhelm Zimmermann. 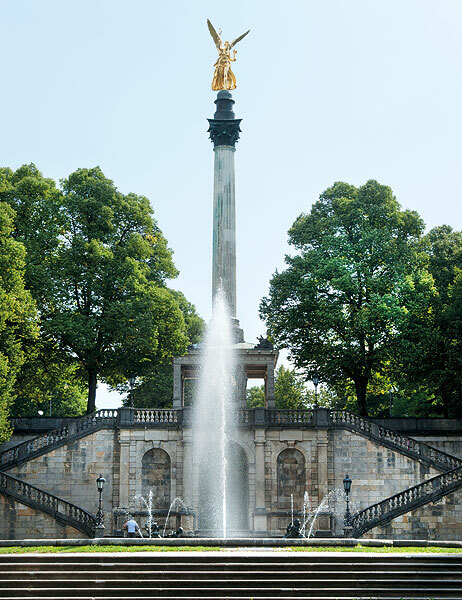 Rising above the terraces in the axis of the Prinzregentenstrasse is the 38-metre "Angel of Peace", which is the dominant feature of the park and is often regarded as a symbol of Munich. Created to mark the 25 years of peace after 1871, it is mounted on a 23-metre column above a small hall, and is modelled on the ancient Greek goddess of victory Nike. Bus or tram to "Friedensengel"